Could Your Birth Control Really Decide Who You Date? Ladies, it's time for some real talk. According to a new study published earlier this month in Psychoneuroendocrinology — which we clearly read daily — women using the birth control pill prefer men with less-masculine faces, compared to non-users. 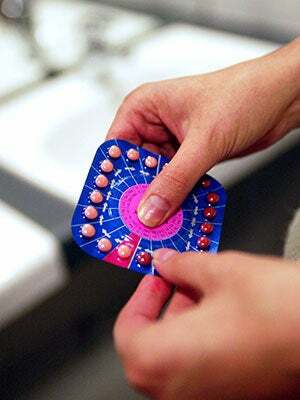 As in, your birth control is indirectly dictating the kinds of men you're interested in and subsequently date. Wild? We know. In the study, researchers showed a group of women (aged 18-24) images of young, male faces. The women could manipulate the images to their liking, focusing on cheekbone prominence, jaw height, and face width. Scientists also told the participants to alter the male faces so they were most attractive for either a short- or long-term relationship. Women who had been on the pill for three months or more chose men who had less-masculine features, with narrower jawbones and more rounded faces. What does this all mean, exactly? Not a whole lot, if you'd ask us. The experiment wasn't double blind, and the subjects were just women on the pill, eliminating a large amount of women who use alternative methods of birth control, such as IUDs. Plus, "gendering" face-types, while inherently instinctual, feels slightly problematic. Just because a guy has high cheekbones doesn't mean you like him for it — or even that he's more "ready" for a relationship.